How to create AJAX PagingBulletedListExtender in ASP.NET? In this article I have explained in detail about AJAX PagingBulletedListExtender in ASP.NET. 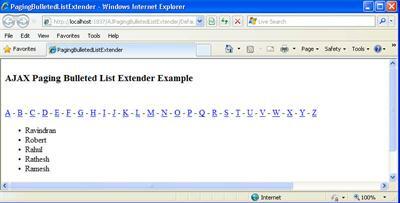 Using PagingBulletedListExtender we can directly select of employee name as per starting letter. This is similar like paging but it sort data as per alpha character selection. Are you looking for AJAX PagingBulletedListExtender in ASP.NET? Then find its detail guideline here. Learn how to create AJAX PagingBulletedListExtender in ASP.NET? Here with I have attached source code of AJAX PagingBulletedListExtender example download and try to learn this concept. I hope this article help to know AJAX PagingBulletedListExtender.